A large, flowering Xerographica specimen. There are nearly 650 species of air plants are in the genus Tillandsia. They are evergreen, perennial flowering plants native to northern Mexico, the Caribbean and the American Southeast. Different varieties of air plants can be found naturally in places including forests, mountains, deserts and swamps. The name Tillandsia translates to 'upon a plant' - referring to the plants tendency to live on top of other plants and trees. Air plants or aerophytes have minimal root systems and often absorb water and nutrients through tiny hairs on its foliage. 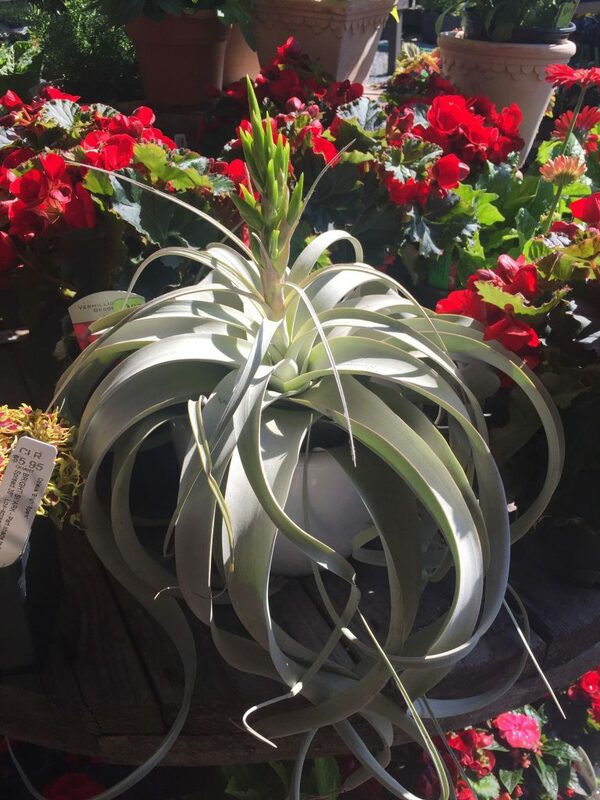 In the gardening world, air plants are unique, versatile house plants that require minimal maintenance. The plants can hang from a bed frame, live in a glass dome or metal cage, or simply sit on a coffee table. The biggest upside, for many, is they are soil and mess free. Once you've found the perfect air plant and location, here are some tips to care for it. Water your air plant 2-3 times per week (depending on air conditions) by thoroughly spraying with filtered or bottled water. In dry conditions, submerge the plant in water for 2-3 hours every other week. Water less in cooler conditions and allow the plant to dry completely between waterings. Protect the plant from frost and give it bright, filtered light. Most air plants thrive in temperatures between 50-90 degrees Fahrenheit. Add a dash of Bromeliad or Orchid fertilizer to your mister to fertilize your plant once per month. Mature plants produce smaller air plants called pups. Wait until the pup is 1/3 or 1/2 the size of the mother plant before gently twisting in a downward motion to detach. If this does not remove the pup, cut downward as close to the mother as possible to free the new plant. The mother plant will continue to live and produce more pups, often for several years. Use glue, wire, fishing line to attach air plants to their desired location. DO NOT nail or staple through the plant's flesh, use superglue or copper wire.